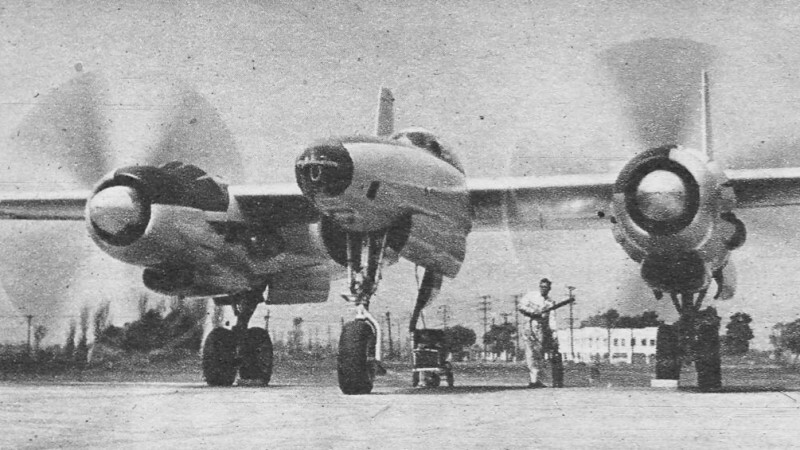 Although it looks a lot like the Lockheed P-38 Lightning, Hughes Aircraft's F-11 was designed to be an aerial photo-reconnaissance platform during World War II, and was much larger than the P-38. Eccentric millionaire and accomplished aviator Howard Hughes served as the test pilot for the XF-11 prototype, which ended up crashing into a couple houses just outside the airport (shown in "The Aviator" movie). Only two were ever built. 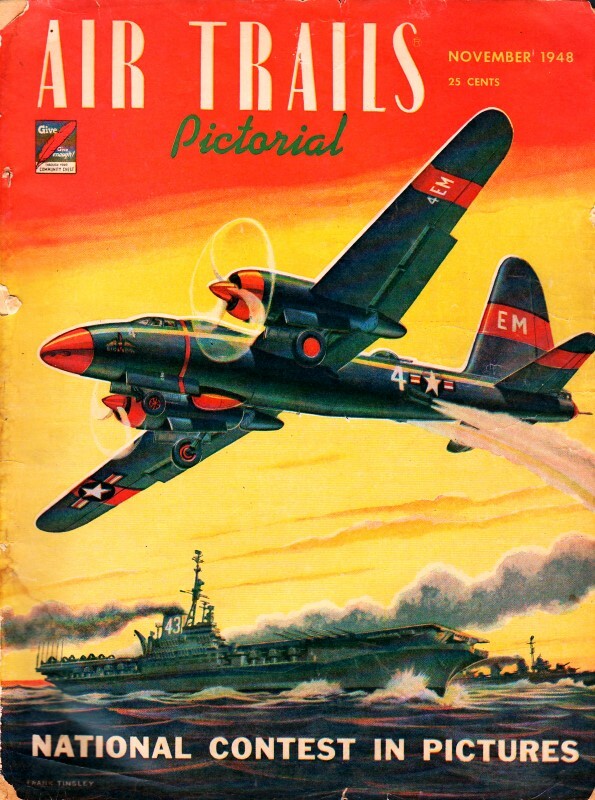 Interestingly, somewhere I have an article in either an American Modeler or another Air Trails magazine what tells the tale of pilot who during World War II used a specially equipped P-38 to take low level, high speed flight photographs of German troop movements along the western side of the English Channel in the run-up to the D-Day invasions. That story will be published here on Airplanes and Rockets as soon as I find it. 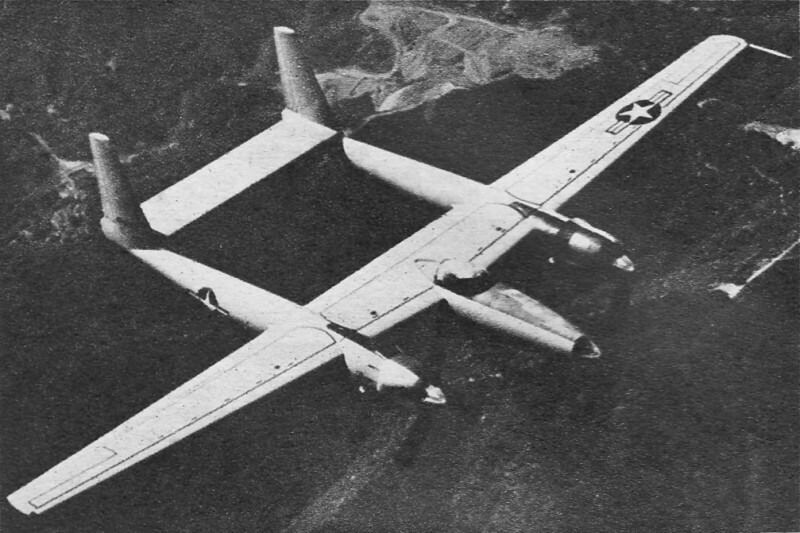 This sleek, twin-engine, twin-boom airplane, especially designed for photo-reconnaissance work, is a product of Hughes Aircraft Corp., Culver City, Calif., and was pretty much of a hush-hush project for a while. It burst into the limelight when its prototype, equipped with eight-bladed contra-rotating propellers, crashed during one of the trial flights with Howard Hughes acting as test pilot. 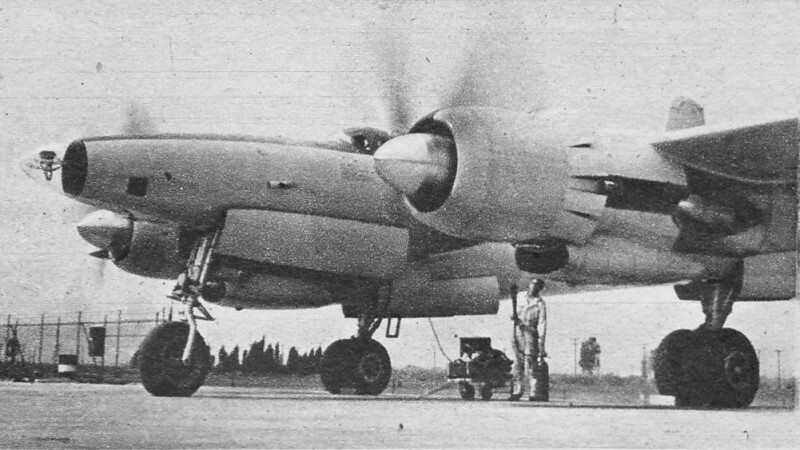 The accident was due to a sudden reversal of pitch of the rear right propeller unit which imposed such a severe yaw on the airplane that it became uncontrollable. Hughes miraculously escaped death but was laid up in hospital for several months. As a consequence, the second prototype, illustrated here, now undergoing test flights at Wright Field, has conventional, four-bladed, Curtiss electric reversible-pitch propellers. 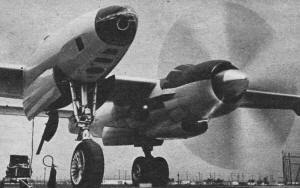 The plane is of all-metal construction with a wing span of 101 ft. 4 in., and a length of 65 ft. 5 in. Weight empty is: 37,200 lbs., gross weight 47,500 lbs. 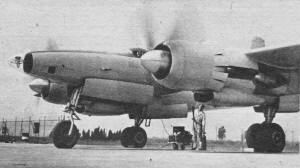 It is powered by two Pratt & Whitney R-4360-37, 28-cylinder engines developing in excess of 3000 hp at take-off. Maximum speed is in the neighborhood of 425 mph, service ceiling is 44,000 feet, and range is 5000 miles. An interesting feature of the XF-11 are the spoiler ailerons like the ones used on the Northrop P-61. This permits use of full span flaps on the wing with the result that the plane stalls at only 80 mph. 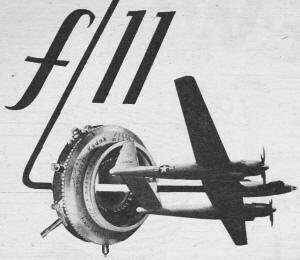 The XF-11 carries a crew of two, seated side-by-side in a pressurized cockpit, second member acting as co-pilot, camera operator, and navigator. 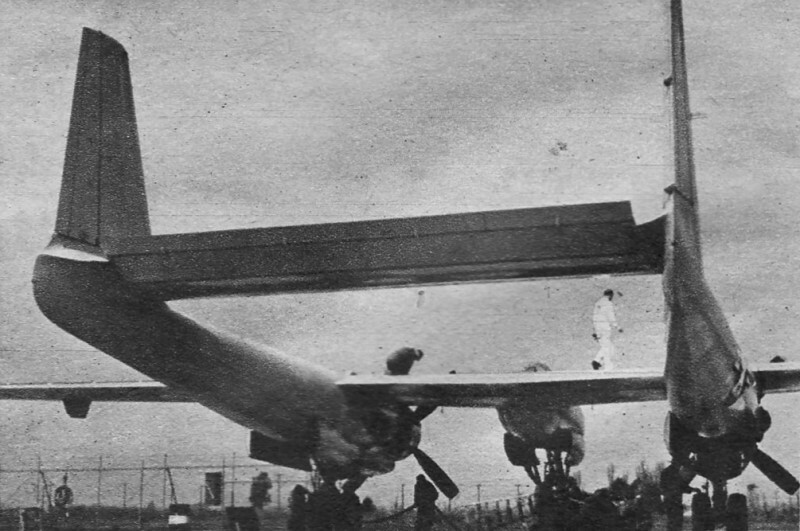 The slim fuselage nacelle houses up to eight aerial cameras which can be operated either from the Plexiglas nose or the cockpit.